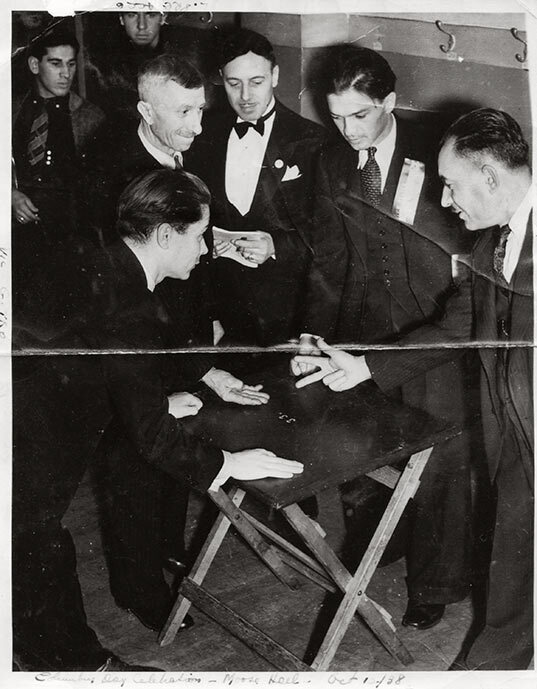 Photograph of Bruno Girardi (second from the right) and unidentified men playing "morra", Vancouver, BC, October 1, 1938. The five men are dressed in formal attire and stand around a folding table. Girardi seems to have a ribbon pinned on his left lapel. Written in black ink at the bottom of the photograph is "Canada Day Celebrations - Moose Hall. Oct 1/38". Morra is a hand game. Variants date back to ancient Rome, and are still played in Italy today. The game was used to decide issues, but also served as entertainment.